The other night, J and I went to our favorite Paris restaurant, Jean, located at 8 rue St-Lazare, in the 9th arrondissement (Métro Notre Dame de Lorette). I have already written about this restaurant several times (see posts of December 28, 2010, December 24, 2011 and March 12, 2012), and had not intended to do so again, but our meal was so excellent that I can't help myself. 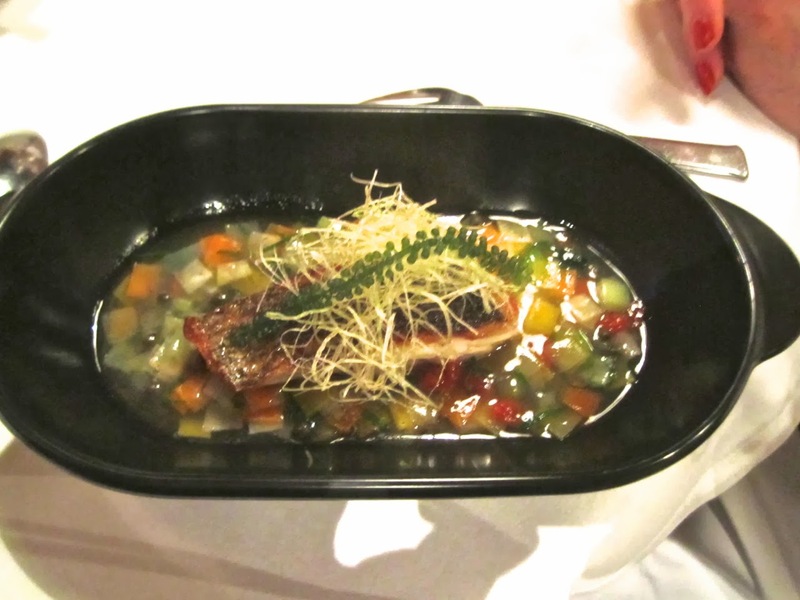 We took the four-course 75-euro menu, and this time also added the complementary wine service for 25 euros. 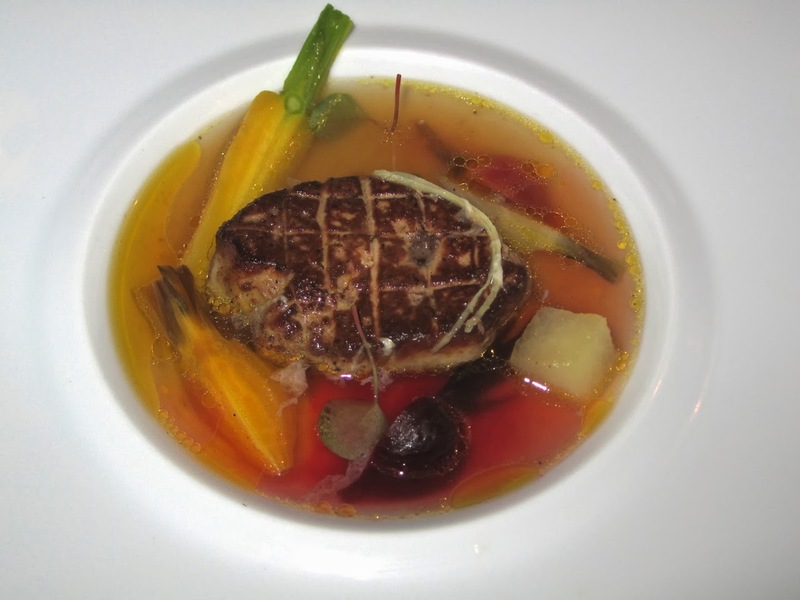 After some excellent amuse-bouches, the meal started with a foie gras that was poached, then grilled under a salamander and served with a bouillon of root vegetables that is perfumed with undetectable amounts of mint and chocolate: superb. 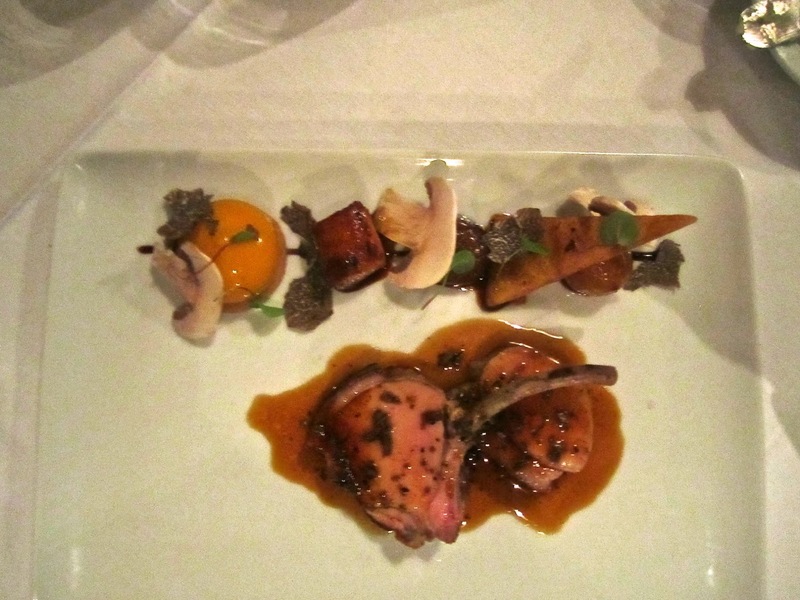 For the meat course, suckling pork chops, with truffle sauce, served with an arrangement of interesting and beautifully prepared vegetables: mushrooms, squash (that's not an egg yolk), a chestnut and a couple of items I can no longer identify. Tender and perfectly balanced. Finally, dessert, a "moelleux" of chocolate served with an excellent lime sorbet and almond milk "spaghetti." This was only okay. 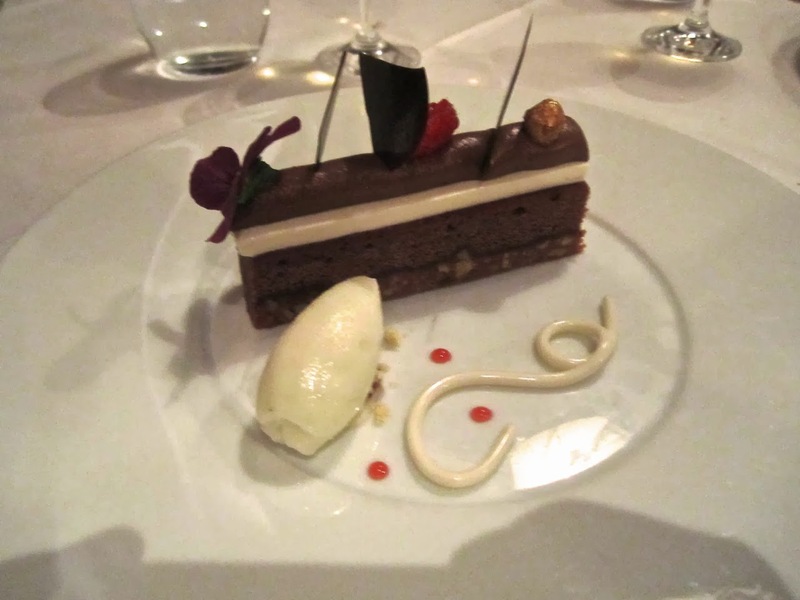 The chocolate cake was not a "moelleux," which should be molten, and the "spaghetti," made with agar-agar, was an unsuccessful and gratuitous venture into molecular cuisine. We found out from out server that the pastry chef was a new member of the team, which explained the significant decline in this area since our last visit. The wine service was not a throwaway. We had a very nice Chassagne Montrachet, a good Medoc from a vineyard related to Haut-Brion and a Corsican Muscat (which pleased me but not J). A great deal at 25 euros per person, equivalent to sharing a 50-euro bottle of wine but much better quality than you would get for that price and infinitely more interesting. Overall, the dinner was excellent, the rapport qualité-prix fantastic as always and the ambiance relaxed but charming. A very good time was had by us.